Today's Draw: Two of Pentacles from the Fairy Lights Tarot in the Surprise position from the Deck of 1000 Spreads. Are you trying to both hide from the world and engage with it at the same time? Is your life, single or coupled, rife with yearning? Are you living full out? 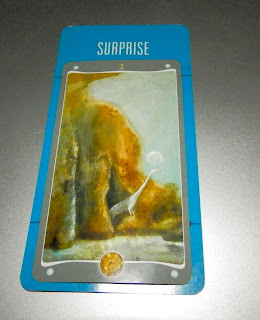 Anyway, I found that quote very thought provoking, but even more so when I chose today's cards. In the little white book for the Fairy Lights Tarot, it says "you cannot both hide from the world and engage with it. Choose your path and commit to it." I guess the surprise is how the two just kind of dovetail together to tell the story of my life...haha. I have to say, though, that my life of solitude does NOT make me yearn or keep me from loving or feeling. But it does keep me from learning and sharing with another in the way you do in an intimate relationship. So it's missing that path of growth and learning. But being coupled misses the path of learning and growing that feeling full in your own company has. Neither path is more noble, but society does push for coupledom. That said, I think that part of the reason I chose to live alone in the first place WAS to protect myself, or at least have more control over my environment. And I found that the above quote was true. Life finds you no matter what. But solitude is my nature. So I found ways to risk my heart. And I found ways to share my life with others without actually having them live with me. While hiding from the world is an attractive notion, I have found you can't have it both ways. So all of this has relevance to me. But I think the life of the loner is misunderstood. I'm someone who often feels drained by being around others. I have low tolerances for the public at large. And while I love to teach, for example, I often need a lot of time to myself in between teaching. But I don't get bored. I have many things going on...my work, my dogs, taking care of my home, visiting friends, and just living a life. When you live alone, everything is your responsbility—nobody helps earn money, take out the trash, mow the lawn. So there's plenty to keep you busy and your imagination flickering. I say all of this because that quote above was wonderful. But it assumed that solitude implied yearning and a lack of heart risk. I can't think of any relationship that risks the heart more than a relationship with a pet. It's the only unconditional relationship you willingly enter into that also requires you to witness the death of that which you love most. That may happen by circumstance in all kinds of human relationships, but it's not usually the choice you make going in. When I first started writing this post, I thought it would lead somewhere else...haha. But it leads right here....to someone who has chosen a largely single life, no longer out of fear as I once did, but now out of choice. Someone who gets plenty of heartbreak and disappointments...haha...and understands my solitude won't save me from it. And someone who could easily choose to be more social and suffer all the same risks, but chooses solitude because it suits me. The surprise of today's draw is that it has helped me realize where I am. I'm not living alone secretly hoping for my life to change. I'm not "choosing" solitude because it's my only choice. I'm not living halfway in one world and halfway in another. And I'm not pretending I prefer to be single over being coupled. I'm living fully in a world that affords all the same options and risks of everyone else's. I know the reality of a romantic relationship and, currently, am happier without one. I'm choosing my life not out of bitterness, a lack of opportunity or naivety, but out of knowing what brings me the most joy. Amen! I'm not "unfriendly" but I also feel drained being around other people for too long. I have to ration my social interactions and often need to retreat for a while.